Arsenic in the groundwaters of south/south-east Asia is threatening to poison over a 100 million people who depend on this sub-surface resource for drinking and irrigation water. Arsenic contamination has reached severe levels around the flood plains of Ganges (India, Nepal and Bangladesh), Mekong (Cambodia and Vietnam) and Red River (Vietnam). Research conducted over the past fifteen years has identified sediments originating from mountains (e.g., Himalayas and Yunnan ranges) and deposited downstream since the onset of the Holocene age to be the major source of arsenic. Natural and/or anthropogenically induced reducing hydrochemical conditions within the Holocene aquifer are seen as the main cause for the mobilisation of arsenic from the sediments into the groundwater. This hypothesis was derived and generally confirmed by a significant number of field studies and associated laboratory experiments that investigated arsenic sorption onto pure and laboratory synthesised minerals, such as iron, manganese and aluminium oxides. Despite the extensive research efforts of the last decade there are still significant research gaps in terms of developing quantitative approaches that describe the sorption behaviour of arsenic on naturally occurring sediments (mixed mineral assemblages) within the affected aquifers. The proposed research will extend our understanding and capacity to quantify arsenic sorption and therefore improve the predictions of arsenic mobility. Aquifer sediments are an aggregation of different minerals which exhibit varying types of adsorption sites and contain ions that compete with arsenic for these adsorption sites. These natural sediments exhibit different characteristics compared to synthesised minerals. This information is important as it enables us to better understand the factors controlling arsenic sorption. 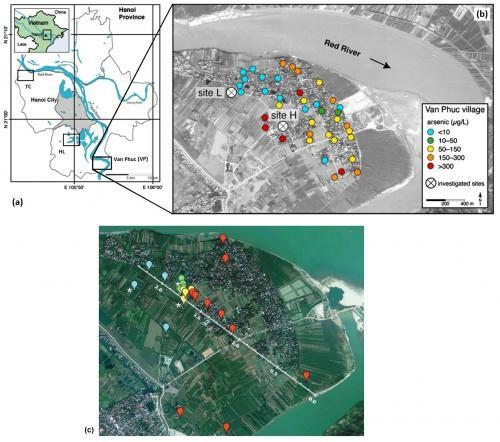 This project will develop and test a surface complexation modeling (SCM) approach for describing arsenic mobility at a well-studied research site in Vietnam. 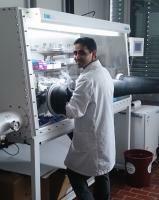 Sorption experiments will be carried out with representative aquifer sediments acquired from this site. SCM parameters will be generated based on the experimental data and will be applied within a site-specific reactive transport model for the research site. The data and surface complexation model (SCM) generated in this project will provide crucial elements for improved analysis and quantification of arsenic migration rates in contaminated aquifers. The SCM will be the first process-based and site-specific arsenite adsorption model to be developed and employed within a data-constrained reactive transport modelling study in Vietnam. While the model will be site-specific, the methodology and the SCM can be applied and adopted for other arsenic affected areas with similar chemical and physical characteristics. The data gathered and the models developed in this research will play an important role in developing strategies for sustainable extraction of low-arsenic groundwater from Pleistocene aquifers.